It's been a while since I've played along with Splitcoaststampers' Featured Stamper challenge. This week's Featured Stamper is Sabrina, who has a HUGE gallery - so much to look at and choose from! I chose this card of Sabrina's to CASE - the 3x3 grid appeals to my 'spreadsheet queen' mind (accountants often have this condition!). I stayed with a blue colour scheme and curvy sentiment but changed the season (in my opinion, now that Christmas is over, spring should arrive!). The flower is from Inkadinkado and the sentiment is from Papertrey. Actually, as you can tell from the photo, it's a lovely, sunny day here in Toronto - we're going toboganning this afternoon, with any luck, for the last time until next Christmas! lol! What a fun, flower-popping card, Ardy! A wonderful CASE!! Hope you had a blast tobaganning! And lots of "Cheers" after!! 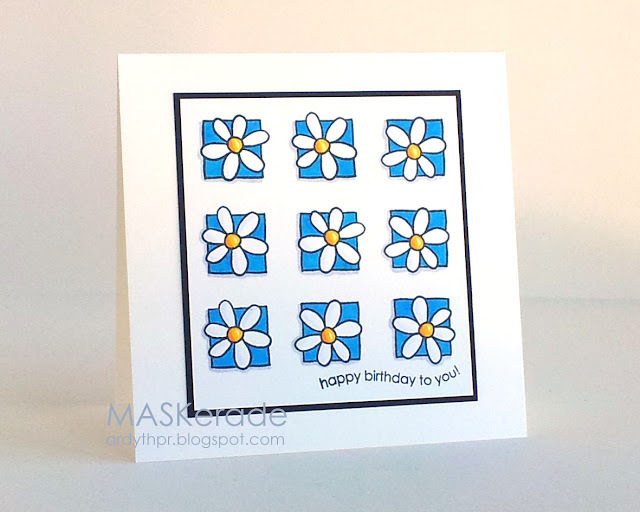 Those daisies are oh so sweet! And I'm laughing about the taboganning. We have several issues of snow...very unusual for us and I'm hoping we're done for the year. Wishful thinking! I agree, I'de be fine if spring arrived early next year! Your card is so fresh and your flowers are light, bright and cheery! Happy New Year Ardyth!! !